The 12-members of the Montana Legislature’s new Joint Select Committee on Pensions have a tough job ahead of them–finding a solution to the state’s indebted retirement systems that will pass both a Republican-controlled Legislature and a Democratic Governor’s Office. Latest figures put the total debt faced by Montana’s pension programs at over $4 billion over the next 30 years. The vast majority of this ‘unfunded liability’ stems from the state’s two largest pensions, the Public Employee Retirement System (PERS) and Teachers Retirement System (TRS). 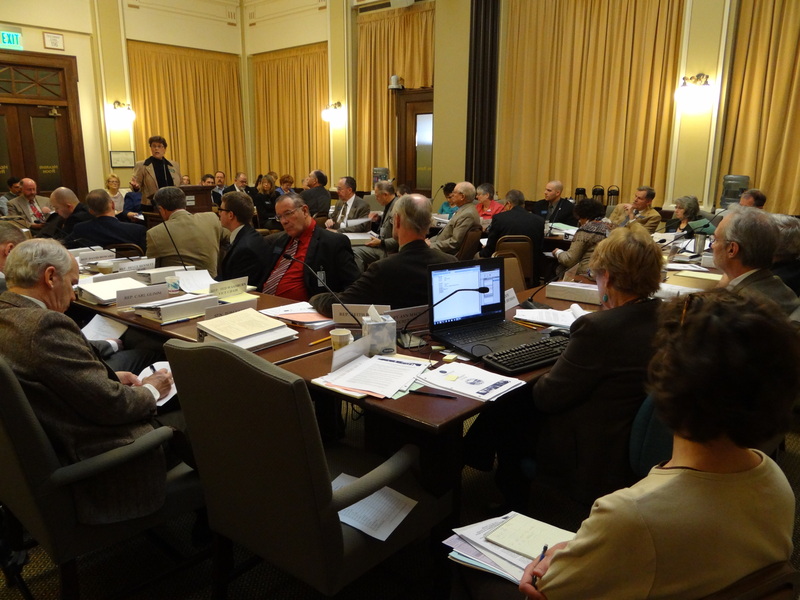 The Legislature’s majority leadership, Senate President Jeff Essman (R-Billings) and House Speaker Mark Blasdel (R-Somers) appointed the eight Republicans and four Democrats to the pension committee, which Lee Newspapers points out caused some frustration from the minority, who feel 8-4 doesn’t accurately reflect the Republican-Democratic split in the Legislature. The pension committee invited members of the House and Senate State Administration Committees to listen in on the first meeting, hearing broad descriptions of the problems from legislative staff. “It definitely is like trying to drink from a firehose on day one,” said first-term Representative and House State Administration Committee Member Casey Schreiner (D-Great Falls) about the complexity of the issue. It’s one that has been labeled as a top-priority for the 2013 Legislature. “Every citizen in the state of Montana has some vested interest in us having our pension systems where they need to be for longevity purposes,” Schreiner said. Democratic Governor Steve Bullock has released a proposal to fix the pensions, one which closely resembles the one put out by former Governor Brian Schweitzer last year. It calls for higher contributions from public employees, their employers, and an infusion of revenue from natural resource development. Bullock calls it a balanced approach that has the support of the state’s largest teacher’s union (MEA-MFT) as well as the Montana Association of Counties and the Montana League of Cities and Towns. Pension committee chair Senator Dave Lewis (R-Helena) hopes for a different approach. He wants the state to move away from the current pension system and put new state employees on 401(k) plans, an idea rejected by Democrats. That would put less financial responsibility on the state but employees would have less retirement certainty due to changes in the stock market. “I think it’s inevitable,” Lewis said. “For public employees it’s going to be very difficult to get there, because we have to pay off the liability to the existing retirees, but we’re still going to have to move toward that.” Sen. Lewis has put forward his ideas in a bill for consideration by the committee, but he’s certainly not the only one. “Almost every legislator up here has something they think we should fix,” Lewis said about the committee. He says his goal is to finalize the proposals from the Joint Select Committee on Pensions for presentation to the full legislature by the end of February. This entry was posted in 2013 Legislature, News and tagged 2013 Legislature, Casey Schreiner, Dave Lewis, Jeff Essman, Joint Selection Committee on Pensions, Mark B, Montana Pension Plan, PERS, Steve Bullock, TERS by Dan Boyce. Bookmark the permalink.